Privacy International is organizing the Global Partners Meeting in London from March 22 to 25, 2013. The workshop will be held at the London School of Economics and Political Science. Sunil Abraham and Malavika Jayaram will be participating in this event. Click to read the full details published by Privacy International here. The meeting is an opportunity to connect global partners with each other and with researchers, human rights advocates, and privacy and technology experts from over 20 countries. This will provide an opportunity for discussion and debate, that will enrich global research and advocacy agenda for the next two years. To understand the privacy discourse and identify the challenges faced in advancing the right to privacy across the globe. To consolidate our network and look for opportunities for collaboration and cross-pollination for research and advocacy initiatives. To share experiences about research, dissemination and advocacy strategies that influence policy change. Research Centre. The focus of the SAFEGUARD project is to understand what are the threats, challenges and obstacles to, and opportunities for, the protection of privacy in developing countries. Nowhere are the challenges to, and opportunities for, privacy protections as dynamic and complex as in the developing world. As these countries seek new measures to develop their economies, build social and technological infrastructures, sustain their social systems, and ensure security they need to consider what are the modern policy frameworks they require to ensure a just society. The windows around these policy frameworks are key opportunities for reflection about rights and democratic values, and in the case of this project, the protection of privacy. The vast scope and relevance of the right to privacy in this age of technology gives rise to a myriad of challenges and issues, many of which have relevance across, as well as within, borders. This is particularly the case in the developing world, where South-South collaboration is gaining increasing currency in the development sector, and donor countries continue to contribute to and influence policy in recipient countries, particularly with respect to the adoption of new technologies. Many of the trends in developing countries – communications surveillance, biometrics and DNA databases, and identity cards – mirror those being adopted in the global North. Policy laundering and modelling, such as that witnessed with respect to counter-terrorism policies in the aftermath of 9/11 is taking hold in the context of communications surveillance laws and national ID databases. Such phenomena raise concerns not only as to the spread of practices that threaten to undermine privacy, but also with respect to the stifling of national policy discourses and legislative processes. This projects sets out to isolate and understand the challenges to privacy in the developing world. In order to ensure that the research developed is sufficiently targeted to influence policy debates, we have identified a set of themes that cover the range of privacy-related issues and that together will give a comprehensive picture of the difficult relationship between privacy and technology. 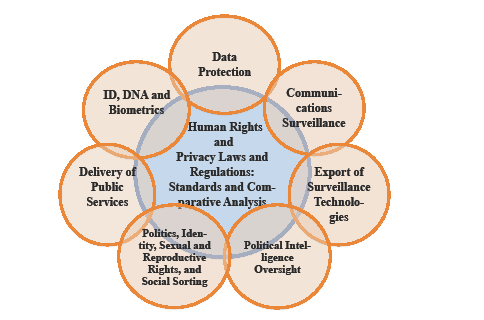 This set of themes has been developed in collaboration with our partners, who have identified those discussions around which there is perfect storm of advancing surveillance policies and technologies, poor legal and technical safeguards, and a scarcity of research and understanding. We have designed our conceptual framework accordingly. The legal and constitutional landscape: What laws and constitutional provisions exist to protect privacy, how are they implemented and monitored, and where are the legal and policy gaps? Data protection: What is the state of data protection in partner countries, and what are the local and regional regulatory standards and good practices? Communications surveillance: What communications surveillance regimes are in place, how are they designed in law and how do they operate in practice? Adoption of surveillance technologies: Where are governments buying surveillance technologies, and how are they using them? What legal regimes are in place to establish safeguards over the use of advanced surveillance technologies? What is the state of the art in legal protections? Political intelligence oversight: What is the nature and operation of local intelligence services, what oversight mechanisms are in place, and how can these mechanisms be implemented or enforced? Politics, Identity, sexual and reproductive health and social sorting: To what the extent do governments misuse personal information to pursue social sorting practices? Delivery of public services: What is the state of privacy protections in public service delivery, particularly those related to e-health systems and social protection programmes, and how can protections be improved? ID, DNA and biometrics: What privacy risks are associated with the collection and use of personal information for ID and biometric systems? Meet with Privacy International staff members and advisors, and workshop participants from more than 20 countries in Latin America, Asia, Africa, Europe and Central Asia. Food and drinks will be provided. Getting there: Our office is a short walk 10 minute from your hotel. See Map 1 below for directions. Building a network: how can PI facilitate your work?